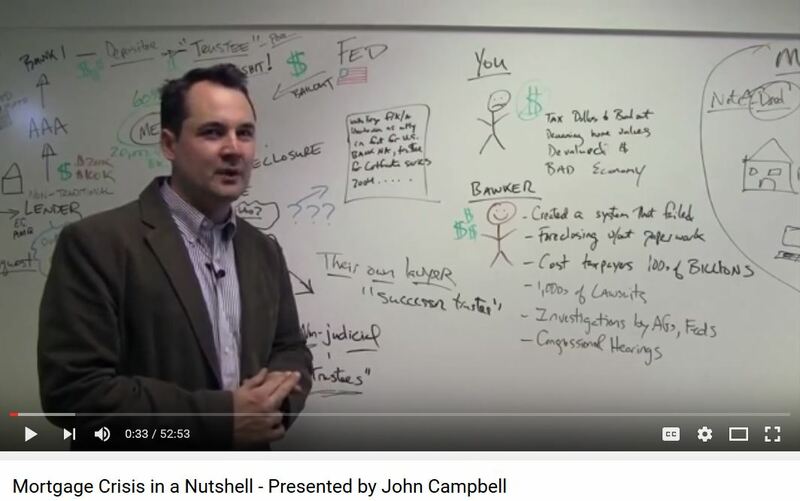 Published on Apr 21, 2012In this one-hour video, Attorney John E. Campbell explains the main aspects of the mortgage crisis that has devastated the U.S. housing market and the economy. This video https://www.youtube.com/watch?v=YBbwb6Sv4PM was produced by John Campbell and Erich Vieth, who are both attorneys (along with Alicia Campbell) at Campbell Law, LLC in St. Louis, Missouri. http://campbelllawllc.com/ John is also on the faculty of Sturm College of Law at the University of Denver. A substantial part of their law practice concerns issues pertaining to mortgage fraud and unlawful foreclosures. The attorneys of Campbell Law have filed numerous individual and class action lawsuits on behalf of behalf of homeowners. Center for Responsible Lending http://www.responsiblelending.org/ (start with the "Mortgage Lending" tab on the home page.